If you are planning to make the most out of your small garden or to completely transform your outdoor living space, then choose us! 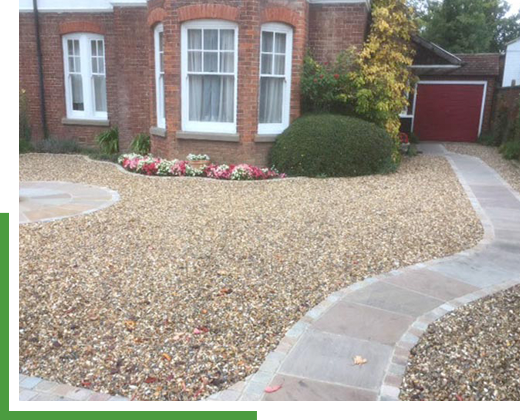 Our highly skilled team have many years of experience in hard landscaping projects in Banstead, Epsom, Reigate and the surrounding areas. As we are a customer-focused company, we vow to work effectively with huge attention to detail. We aim to exceed your expectations from the planning to the finished product. We work closely with customer concepts, particular in our landscape design work. In our position as a trusted builder, we recognise the importance of staying true to the original design dreams of our customers. In our role as an experienced builder, we fully comply with strict industry guidelines. We always excavate ground to specified depths to allow for a full sub-base and final screed. This ensures there are never any soft spots in our groundwork that could led to movement and shifting in the future. We are comfortable working on uneven surfaces. Our team can create garden steps and we even erect garden buildings for your convenience. We are proud to say we can guarantee 10 years of workmanship for the services we provide.